Stone retaining walls offer definition and textural contrast to a landscape, and help solve drainage and erosion issues. You can also build a stone retaining wall to add tiered flower beds on a slope. Installing a retainer wall with paver stones entails laying a strong base to support the wall and stacking the stones so the wall is stable. Once complete, add cap stones to the top to prevent weather or frost damage. 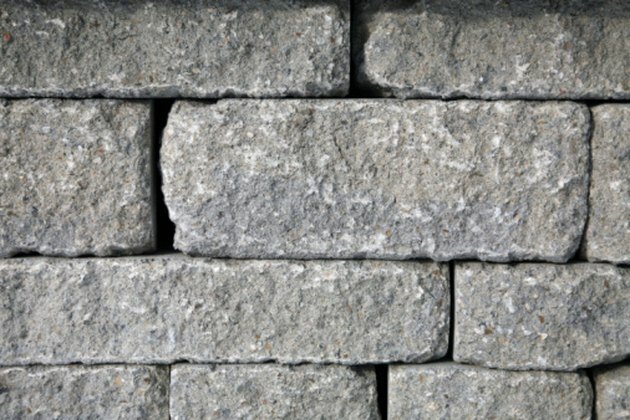 Stagger paver joints to build a wall with structural integrity. Create a building plan for your wall by measuring the site to determine how tall it should be. Insert posts in the four corners of the site and wrap a string around them to outline the wall. Measure the dimensions of the paver stones and dig a trench as deep as the pavers, plus 6 inches. The width should be 8 inches plus the stone length. If your area gets freezing temperatures, protect the wall from frost heaves by digging the trench below the frost line. Roll a strip of landscape fabric over the trench to improve drainage and deter weeds from growing beneath. Pour 3 inches of gravel over the trench and pack it down with a hand tamper. Pack another 3 inches of gravel over the trench and tamp it down. Add 2 inches of course sand or crushed limestone over the tamped surface. Place the paver stones in the trench flush against each other until the first course is complete. Fill in gaps in the trench with crushed limestone or gravel to provide extra support for the wall. Lay the second course over the first, using a half stone at the end to stagger the joints for structural support. Continue laying courses until the wall is complete, beginning and ending every other row with a half stone. Backfill the wall with a layer of top soil after you finish each course to reinforce the wall and aid drainage.